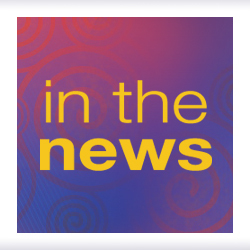 Fridays on the SCBWI blog, I share snippets of and links to some of the publishing/media-related news I've read during the last week that I found interesting, helpful, and/or fun. Click titles to get to the full articles. Among this week's news: Sterling's new YA imprint, social networks and marketing, Scholastic's own social network, the MySpace redesign, B&N's Nook plus color, kindergartners in a bookstore, a book seller in an elementary school, rearranging YA in B&N, raising boys who read, a PW interview with SCBWI board member Linda Sue Park, and more. Splinter, Sterling Publishing’s young-adult imprint, will launch with a three-part fantasy series by Colleen Houck. Breaking the tradition of publishing one book per year, the Tiger Saga will be available in its entirety by the end of 2011. Splinter will release Tiger’s Curse on January 11th, Tiger’s Quest on June 11th, and Tiger’s Voyage on November 11th. The books will be published in both hardcover and eBook formats. In a sign of just how popular teen fiction has become, Barnes & Noble is in the midst of rearranging its teen fiction section chain-wide this week in an effort to improve the shopping experience and boost sales. Already teen fiction is the biggest book growth category at Barnes & Noble, according to Mary Amicucci, v-p of children’s books. In terms of volume, it is the second largest subject, behind adult fiction. Nearly 80 publishing professionals tuned in to a BISG-sponsored webcast, “Marketing ‘Books’ in a Digital World,” on Wednesday. The hour-long discussion covered a range of tactics publishers are taking to get their books into readers’ hands, but the topic that loomed largest was social networking. Scholastic is releasing a new social networking site today, YouAreWhatYouRead.com, that lets people build a profile based on the five books that were most influential in their lives. Like GoodReads and other social networking sites for readers, users can find other people with shared literary interests, or “Bookprints,” as Scholastic calls them. 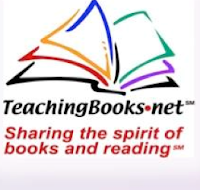 Scholastic books don’t appear to get special billing on YouAreWhatYouRead.com, and nearly every book in print from any publisher is available for users to catalog on their profiles. There is a strong celebrity angle to the site, with visible profiles for more than 130 well-known personalities ranging from Bill Gates to Whoopi Goldberg. Approximately one year after introducing its first e-reading device, Barnes & Noble took a major step forward Tuesday with the introduction of the Nookcolor, a $249 tablet with a seven inch VividView Color Touchscreen. The addition of color to the e-reading device allowed B&N to officially announce Nook Kids, which in addition to 12,000 chapter books, will have 130 picture books at launch with that number expected to double by the end of the year. Some of the children’s books will be enhanced e-books, featuring video and audio. A third part of the launch was the announcement of Nookdeveloper that will allow creators to develop “reading-centric” apps that will be sold through the Nook app store. Since the Nook runs on the Android platform, apps from the Android Market can be ported to the Nook, but Android Market apps will not automatically be sold through the Nook since B&N want to curate the store, company CEO William Lynch said. In keeping with a tradition of quietly releasing news on Fridays, Amazon revealed last week they will soon allow readers to loan Kindle books to other users–one crucial feature that many readers have sought. When I was a young boy, America's elite schools and universities were almost entirely reserved for males. That seems incredible now, in an era when headlines suggest that boys are largely unfit for the classroom. In particular, they can't read. According to a recent report from the Center on Education Policy, for example, substantially more boys than girls score below the proficiency level on the annual National Assessment of Educational Progress reading test. This disparity goes back to 1992, and in some states the percentage of boys proficient in reading is now more than ten points below that of girls. The male-female reading gap is found in every socio-economic and ethnic category, including the children of white, college-educated parents. The good news is that influential people have noticed this problem. The bad news is that many of them have perfectly awful ideas for solving it. Every year the Shelburne Community School kindergartners come to the bookstore. They walk over, hand in hand, from the school down the road. They pile into the store, one class at a time and settle in the picture book section on our comfy rug. It’s a cozy tradition. My alumni association loves me; every time they ask me whether I want to give a talk, I say yes. Today I went back to my elementary school to teach seven-year-olds about book reviewing. If you’ve ever wanted to get back to basics in your work or personal life, try explaining what you do to a very smart seven-year-old. I knew I was going to be facing a tough audience: perceptive but easily bored. Fortunately, I also knew that they were all interested in books and reading–and in having and sharing opinions. I dip in and out of Twitter, and lately it’s been obvious to me that I’m looking at the same personality types no matter where I go. Here are 9 – Which one are you? Want to know what the future workforce thinks of technology, how it uses search engines, social networking, and online collaborative tools? The recently released ECAR Study of Undergraduate Students and Information Technology gives some excellent insights into trends in college students' technology ownership, perceptions, skills, and habits. The 2010 report was recently released by EDUCAUSE, a non-profit organization that supports the advancement of technology in higher education. The report is based on a survey from the spring of 2010 of over 36,950 freshmen and seniors at 100 four-year institutions and students at 27 two-year institutions. Apple’s iPad goes on sales today at AT&T Wireless and Verizon stores. The tablet is popping up in various retailers this holiday season, as Apple hopes to push the iPad as this year’s holiday gift. The iPad is already available in Target, Wal-Mart and Sam’s Club. MySpace on Wednesday (Oct. 27) will unveil a striking redesign that represents a culmination of the News Corp.-owned social network's attempt at reinventing itself as an entertainment hub. According to president Mike Jones, MySpace had long suffered from what he calls "design debt"—i.e. an accumulation of different looks and incompatible functionalities. For example, there had been 117 different styles for the MySpace logo alone. Therefore, rather than undertake a simple redesign, Jones and his team elected to completely rebuild the site "from the ground up," he said. "This is something we can now build upon." Linda Sue Park is the Newbery-Award winning author of A Single Shard and other acclaimed novels and picture books. Her forthcoming book, The Long Walk to Water, profiles two young people in the Sudan—one based on a real Lost Boy, who was forced to flee his village, the other a fictional girl who collects the water for her village. It's humpday which means it's time for me to share some of my favorite tweets of the last week from the many writers, illustrators, editors, agents, and publishers who are out there sharing information and joining in the conversation on Twitter. Click on the Twitter handles (@name) to find each tweeter's page should you wish to follow them or read more of what they're saying. Follow the included links to read the articles or blog posts these tweeters recommend. Remember--whether you're signed up with Twitter or not, you can read tweets and click links to find helpful blog posts, useful articles, and timely news bits (like the ones below). This week's picks (and a few links) are all from Kidlit Con 2010 which I attended last weekend in Minneapolis so enjoy, bloggers! (It was fun to attend a conference where the word "platform" meant Blogger or WordPress.) A lot are my own tweets (because tweeting is a great way to take conference notes) and it's heavy on a handful of other users who joined me in the #kidlitcon tweet-o-rama! 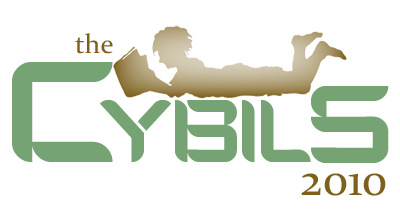 You'll find Greg Pincus' transcript of all the #kidlitcon tweets here. Below I've pulled out some gems and categorized them (on blogging, blog tours, virtual school visits, kidlitosphere, and more) so they're easier to follow for those of you who didn't attend. After you read my post, promise you'll start including "sciency fiction" and SNAPping in your vocabulary. And don't miss the Periodic Table of Cupcakes. @alicepope: Maggie Stiefvater: first thing she learned about blogging: the world doesn’t need another blog. @alicepope: Maggie S: Boring people offline are boring people online and sometimes interesting people offline are boring people online. @alicepope: Says @mstiefvater: You make a personal connection when you blog. People will know your cat’s name. 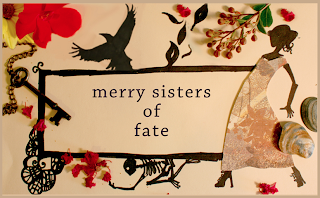 @alicepope: Ten years ago, my career arc would not have been possible, says @mstiefvater. Blogging made it happen. @CERodriguez: Gave props to @Squarespace, my web hosting platform, at #KidlitCon session for best blogging practices. I hope more writers will use it. @alicepope: Michelle Corriel: When answering blog tour questions, don’t cut and paste answers from blog to blog. @thepageturn: Good blog interview question for authors: What is the best writing advice you’ve ever received? @thepageturn: Corriel: Another quality (and fun) question to ask authors on a blog tour: Are you a plotter or plunger? @lovelyleann: Authors talking about blog touring. “Self promotion is a necessary evil for authors” and blog tours is a great way to do this. @alicepope: Avasthi: When planning a blog tour, reach out to lot of different types of bloggers. @alicepope: Avasthi: Don’t have too many blog tour stops (26 is too many; 10 or 12 is better). @alicepope: Avasthi: Have a media page on your website for bloggers with info, bio, etc. @MaryLeeHahn: But authors shouldn’t be expected to offer Skype visits for free. @teacher6th: charge for a skype vist? Personally I never pay for Skype because my school can’t pay…students do buy their books…. @MaryLeeHahn: Kidlitosphere is about COMMUNITY. @thepageturn: More than 1000 eligible nominations for Cybils this year! Crazy! @thepageturn: 200 ppl applied for 100 slots as Cybils judges. Wow. @mosylu: blogging as a group also builds community within the group. We’ve found that in the kidlitosphere too! @alicepope: Laura Lutz from Harper Publicity says don’t embark in social networking and blogging if you can’t fully embrace it. @thepageturn: Blog I haven’t heard of before: Children’s War. All kids books about WWII. Fascinating! @mudmamba: Thinking about how blogging the backlist/out of print books will tie in well with the rise of e-books. @mudmamba: Amen! “If you don’t want it public, don’t put it online.” Big old period right there. @alicepope: Janet Fox: play to your strengths when it comes to social media and participate. @alicepope: Llewellyn has a SNAP Committee–Social Networking and Publicity. That must catch on! And be verb-ified. Authors, get SNAPping. @LizB: Libraries need professional reviews to inform buying decisions & also to provide backup for book challenges. @thepageturn: Robinson: We all want to get paid to blog…but as soon as we’re paid, it becomes work. Difficult to keep it fun. @alicepope: Houtman: wants to get a new genre term adopted–‘sciency fiction.’ Who’s on board? @mudmamba: I think I’m only 1 at #kidlitcon matching all 3 of these criteria (a) not female (b) not an organizer (c) not named Steve. It's no secret that the key to successful blogging is community. But mostly that community communicates from their keyboards--posting, commenting, and emailing from the privacy of their own home offices or neighborhood coffee shops. So it was a rare treat that 80 or so bloggers (myself included) emerged from behind their keyboards to converge on Open Book in Minneapolis for the annual Kidlit Con. 1) An online presence truly can make a career. The weekend started off with a terrific Friday night panel by the Merry Sisters of Fate (Maggie Stiefvater, Brenna Yovanoff, and Tessa Gratton) during which they discussed their tremendous critique trio relationship (mostly done via Google chat), an illustration of how online communication of can impact the career of an author. Maggie underscored this idea in her Saturday morning keynote, describing how blogging helped her career as an artist and writer living in middle-of-nowhere Virginia. "Blogging can be good for you professionally and good for the soul," said the New York Times bestselling author who's toured the likes of Lithuania recently. "Ten years ago, my career arc would not have been possible. Blogging made it happen." (Note: I'd rather be reading Maggie's book LINGER than blogging right now. It's calling to me from my nightstand.) An example: Instead of sending her on tour during fall when school visits would precede bookstore event--and bring in teen readers--her publisher sent her out during the summer, banking on her blog presence to bring in fans. It's worked beautifully. The kidlitosphere is a community and you can't be part of a community if you're a hermit. You've got to read other people's blogs if you want them to read yours. You've got to leave comments. You've got to tweet and facebook links to other posts you like by other bloggers. You cannot blog in a void. You've got to make friends. 3) There's strength in numbers and 3b) There are voids to be filled. Elissa Cruz and Kurtis Scalleta offered a great session on the birth of their ginormous group blog From the Mixes Up Files...of Middle Grade Authors. Elissa had the idea to start a blog by MG authors focusing on MG books, posted her idea on a message board, and was overwhelmed by the response. There are currently 30 writers and illustrators participating in Mixed Up Files. A group blog such as this offers plenty of bloggers to share the workload, a big talent pool to draw on, and lots of varied expertise within the group. And In middle grade, Elissa found a hole that needed filling in the world of kid lit blogs. Mixed Up Files got great traffic right out of the box and is likely to become the go-to spot online for the MG gatekeepers--teachers, librarians, and parents--for reading lists, interviews, and all things MG.
4) Book review bloggers are a powerful and far-reaching bunch. During Kidlit Con, I was thrilled to have the chance to chat with with Pam Coughlin of Mother Reader, Jen Robinson of Jen Robinson's Book Page, Sarah Stevenson of Finding Wonderland, and Liz Burns of A Chair, A Fireplace and A Tea Cozy also heard them participate in a panel about the Cybil Awards (given to books in a number of categories and judged solely by kidlit bloggers). This year their call for potential judges yielded 200 volunteers for 100 open spots. (Yours truly is a second round YA fiction judge!) During the book nomination period, an unnamed publisher wanted to nominate their entire list. Authors like Jane Yolen and Lee Bennett Hopkins were talking about the Cybils on facebook. Beyond the popularity of their award, they hold an annual blog book tour, and publishers seem happy to offer them review copies (based on a panel of marketing folks from Lerner, Flux, and Harper). These reviewers are reaching the gatekeepers, and publishers are aware of that. During a panel on virtual school visits, Kidlit Con was joined via Skype by Nick Glass of TeachingBooks.net. (I likened this virtual panelist to The Giant Benevolent Wizard of Oz with headphones.) With a laptop and a projector (and no IT or AV professionals), Nick was able to fully participate in the panel, offering information and answering questions. Authors should really consider using this technology for virtual visits. Conference co-coordinator Andrew Karre continues to update the Kidlit Con blog with links to conference-goers' recaps. (Click here, and here for particularly good ones.) Conference PowerPoints will follow. You can check out the official Kidlit Con 2010 Flikr page (and add photos if you have them). Kidlit Con 2011 will be held in Seattle. Kidlit Con 2012 will be held in New York City. If you're a blogger, you should come! 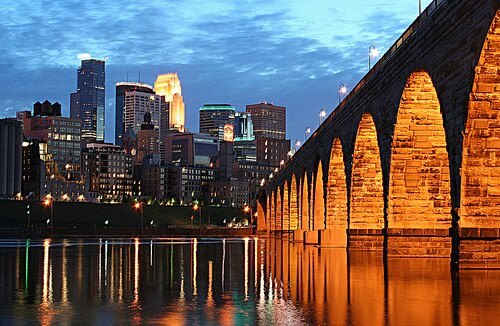 Tomorrow I'm off to Minneapolis for Kidlit Con 2010! Kidlit Con is a conference just for the community of children's and young adult book bloggers. The 2010 event will be held at Open Book in Minneapolis on Saturday, October 23 and is hosted by three kidlit editors--Andrew Karre (Carolrhoda), Ben Barnhart (Milkweed), and Brian Farrey (Flux). Blogger and New York Times Bestselling Author Maggie Stiefvater is the keynote speaker for the event, which includes a full day of innovative and informative sessions. Gathering at Kidlit Con allows bloggers who deal in kidlit (including editors, writers, librarians, teachers, reviewers) to instruct and learn from one another. It's also a great excuse to get out from behind our computers and meet one another in the flesh! During the Friday night and Saturday events well be discussing things like best practices, blog tours, YA and MG blogging, publicity, school visits via social media, and more. I'll be offering my takeaway from the event in this space, so please tune in next week. I'll also be tweeting throughout so check out my Twitter feed and search for #kidlitcon. In the meantime, is there anything you'd like me to ask? Any blogging-specific questions you'd like answers to? Please let me know via comments. This week's picks and links includes query advice, teen/YA stuff, a discussions sparked by B&N's "Paranormal Romance" section, some scary story action just in time for Halloween, and I whole bunch of things that I like but am not feeling clever enough to categorize. Have at it. @planetalvina: @literaticat @PWKidsBookshelf And where do the paranormal books that aren't romances go? They DO exist. Really! @literaticat: I wasn't suggesting Paranormal & Fantasy ARE two different things. Just pointing out that B&N has fantasy in the "Teen Paranormal" section. @barrygoldblatt: @literaticat Most gave up on any distinction years ago...pisses me off constantly. just like all science fiction is dystopian. Stupid. @MandyHubbard: I'd say a quarter of #queries are probably much too long or way too short. The best pitches are usually 2-3 paragraphs. @korakos: NTS: If you find an agent and think OMG PERFECT, do not get drunk to query them, even if it does settle one's nerves. @DanielLiterary: The pub business seems to be picking up a bit. I've done 5 deals in the last 30 days. @mitaliperkins: Want to feel like a rock star? Write Kid/YA books. Shy girl after my visit: "May I touch your sweater? I want to say that I touched you." @maybegenius: Tweet your 130-character Halloween stories to #hallowfic - scary story party! I AM GOING TO MAKE THIS A THING, GUYS. Among this week's news: two pieces in the Huffington Post offer (yet more) reactions to the NYT picture book piece; kids and screen time; National Book Award finalists (in case you missed it); a new Seuss manuscript and new book from Hilary Duff (did I just mention them both in the same sentence? ); Facebook vs. Twitter for content creators, children's comics; iPad news, authors who wrote in their birthday suits; Grover spoofs the Old Spice Guy (video below); and more. The recent New York Times article, "Picture Books no Longer a Staple for Children" set off understandable ripples of concern, anger, worry, and dismay. But I have to say it didn't bother me because what I see in my little corner of the reading world has me certain that the picture book is alive and well. What I do see as changing is a broadening (not narrowing) of the age of the audience and a wonderful extending of the concept and form of the book itself. Children and teens in the United States spend an average of seven hours a day using television, computers, phones and other electronic devices for entertainment, compared to an average of three hours a day watching TV in 1999, according to the American Academy of Pediatrics (AAP). Parents, physicians and educators need to understand the effects of this increasing exposure to media and educate youngsters about media use, the academy said in an updated AAP policy statement released online in advance of publication in the November print issue of the journal Pediatrics. Today, writer Pat Conroy announced the finalists for the 2010 National Book Award from the Flannery O’Connor Childhood Home in Savannah, Georgia. The finalists include rock legend and poet Patti Smith, whose memoir Just Kids (Ecco) is a nonfiction finalist, and Man Booker finalist Peter Carey, for his novel Parrot and Olivier in America (Knopf). Would you pay $1,000 for a handwritten Dr. Seuss book? That’s the current bid for a long lost Dr. Seuss manuscript up for auction at Nate D. Sanders. The collection is pictured above, via the auction site (click to enlarge). It's not enough to just be an actress these days... or a singer... or a fashion designer...or a model.... or a combination of all five as Hilary Duff is. Today's young stars seem to feel the need to try their hand at absolutely everything, especially crafting their words of wisdom into the novel form. 23-year-old Duff is the latest celebrity to join the ranks of author, with the release of her new book, Elixir. While sales of graphic novels are down, comics for children and teens seem to be a bright spot, and they were attracting plenty of attention at New York Comic Con last weekend. Traditional children's publisher Archie Comics had some of the biggest news of the show with the announcement of a new line of Mega Man comics, based on the character from Capcom's video game. The comics will be written by Ian Flynn and drawn by Patrick "Spaz" Spaziante, who both currently work on Sonic the Hedgehog. The new series will debut in spring 2011. Children’s book publisher Albert Whitman & Co. has reached an agreement with Open Road Integrated Media to publish all 150 titles of Whitman’s Boxcar Children Mysteries series in e-book format. The first 19 e-titles in the series will be released in time for Christmas 2010. Originally written by Gertrude Chandler Warner, who wrote the first 19 books, the popular series has sold more than 50 million copies across the 150 titles. Oceanhouse Media’s The Berenstain Bears app tops the Top Paid apps in the book category this afternoon. Disney Publishing Worldwide’s Winnie the Pooh app follows this $2.99 children’s story app at No. 2. Which has more value to content producers – a tweet or a Facebook share? New data from SocialTwist throws up some interesting answers. The company’s Social Media Sharing Trends 2010 Report is based on the social media sharing analysis of millions of referral messages sent using the Tell-a-Friend widget from August 2009 to July 2010. It suggests that Facebook is the dominant social networking site for sharing links but Twitter might be better for click-throughs. Apple is gearing up to push iPads this holiday season by stocking up on the popular devices in big box retail stores. The iPad is going to go on sale at WalmartWalmart this season, and according to reports, it could be any day now. A lot of my mommy friends have expressed frustration that there are no good lists of kid-friendly YouTube channels and playlists out there, so here at Social Times we’ve decided to compile one. I’ve put together a list of 20 great YouTube channels and playlists for kids that moms will love, based on recommendations from friends as well as my own love for children’s television. Check out our 20 picks after the jump and stay tuned at the end for 5 fun YouTube channels geared towards moms as well! Writers have always had interesting stories beyond the ones they put down to paper. Here’s the naked truth: Neatorama has outed seven well-known authors as nudist writers. The authors are Victor Hugo, Ernest Hemingway, D.H. Lawrence, James Whitcomb Riley, Edmond Rostand, Benjamin Franklin, and Agatha Christie. Sesame Street’s spoof of Old Spice’s “The Man Your Man Could Smell Like” commercials has reached 2.6 million views in just five days. Given the video’s rapid spread, we reached out to Miles Ludwig, vice president and executive producer of Digital Media at Sesame Workshop, to find out how the concept was hatched. Author Sara Wilson Etienne had not heard of SCBWI until she moved to LA in 2003. "In fact, it'd never even occurred to me that writing was anything but a solitary activity," she says. "Then I went to LA Writer's Day and got the chance to hear the marvelous and hilarious Paula Danziger speak. And if that wasn't enough, I got to hear editors and writers describe their collaborative process. And, of course, I met new writer friends. It was a revelation." Below Sara talks more about how SCBWI helped her writing career, tells how she found her agent, gives the scoop on her debut novel (coming from Putnam in Spring 2012), talks about her editorial process, offers advice to writers working toward publication, and more. Find Sara online at sarawilsonetienne.com. How did SCBWI help your career move forward? When did you join? When did you attend your first SCBWI event? Why would you recommend SCBWI to other writers? A few months [after I joined SCBWI], I went to the Annual Summer Conference, I was blown away again. I went from isolation to community in one long weekend. There were hundreds of people doing the same thing I was doing. Wonderful, successful writers struggling with the same challenges I had. Real life editors walking among us mere mortals! I was in heaven and I never wanted to leave. So I didn't. From then on, I went to the Westside Schmooze (which I later co-coordinated), availed myself of Critique Connections where I found a writers' group, and signed up for consultations at the yearly Summer Conference. Joining SCBWI was like opening a door to the kidlit world and realizing that I didn't have to wander through the forest alone. In fact, someone had already packed me a picnic lunch, some good books to read, and put up 'Beware of Wolf' signs where appropriate. Tell us about meeting your agent Michael Bourret. How did that come about and how long until he signed you? Meeting Michael was a series of connected events that unfolded over a couple of years. I'd already been writing for a while, but I hadn't looked into agents because my book wasn't ready yet. One year at the Summer Conference, I was matched with Jennifer Hunt at Little, Brown for my consultation. Now, she's a very smart editor and was able to explain things in a way that made me see immediately how to fix them. At the end of our consultations, she asked me if there was anything else I wanted to ask her about writing or the industry. A little voice in my head, the one I'm not used to listening to, said 'Ask her! Ask her!!" And so I opened my mouth and forced myself to ask the awkward question, "Can you think of any agents that might be a good match for my story?" And she said, "Michael Bourret." And I must admit, I pitched my book horribly to Michael. And I'm sure the espresso I'd just swigged didn't help either. But Wonder Woman saved the day. I'd written backup, emergency questions in my notebook to give me some confidence and as soon as I pulled it out, Michael took one look at the cover and said, "I love Wonder Woman!" That moment of bonding gave me the courage I needed to regroup and repitch... this time doing a much better job. It was actually another 6 months until I was ready to submit to Michael, but when I did, he got my story right away. His insightful, smart comments about what he loved and what still needed work made me sure this was a great match. He knew exactly the story I was trying to tell and knew how to help me get there. That is what you want in an agent (and an editor for that matter.) Well, that and a love of Wonder Woman. Your debut novel THE HARBINGER will be released by Putnam in the spring 2012. Tell us a little about it. The 'likely-to-be-renamed' HARBINGER is a supernatural thriller set in a very near future... a place of oil embargoes and rioting cities. Faye just wants to live the normal life of a 16 year-old girl. Unfortunately, she’s far from normal. Disembodied voices whisper in her ears. Rooms dissolve into ocean waves. Drums pound in her mind. Her questionable sanity lands her on an island in Maine, at Holbrook Academy. There, hemmed in by razor wire and locked in solitary confinement, Faye is left to drown in her own hallucinations. Only the low, quiet voice of Kel, the guy in the next cell, is able to reach through Faye’s nightmare and pull her back to reality. But despite their undeniable connection, Faye’s world continues crumble around her. She begins to lose time, waking up in strange places surrounded by crudely drawn symbols. As Faye’s life unravels, Kel and her assigned ‘Family’ group get tangled up in the madness. Now Faye must uncover the secrets that brought her to Holbrook. Before the past destroys them all. Where are you in the editorial process? How has it been for you? Any surprises? I'm most of the way through my first revision with Stacey Barney. It's been terrifying and thrilling and very exciting as I get to towards the end. I'm starting to see all of the little changes coming together in a big way. The one thing that shouldn't surprise me anymore (but always does anyway) is how important another set of eyes can be. And not just any eyes... Stacey is a deep and detailed reader, pushing me to develop my world, my characters, and my story as far as they can go. It's hard to have someone challenging you that way, it's even a little threatening... I won't deny that I yelled at my manuscript a few times while reading line notes. But Stacey was spot on in her editorial letter and even asked new questions that I'd never managed to ask myself. Despite all this, there were still some problems I didn't know how to fix. In one of our phone conversations I went on and on, hopelessly, about one of these problems, saying "If I fix it this way it causes these problems, but if I fix it that way it causes these other problems." I was about to tear my hair out when she said, "Well then, why don't you fix it this other way." Light bulbs went on and bells rung and the crowd went wild! Why hadn't I thought of that? Because, having spent years on this book, I was stuck in a little box of my own making. Often it takes another person to help you find a solution. Lesson learned... at least until the next time. What do you have planned in the way of promotion of your debut novel? Well, I'm still very much in the brainstorming stage, but I am hoping to get a little creative. I'm excited to create a book trailer that really intrigues and entices people. And I already have some very talented friends involved in the process. This is one of those times when it's great to live in a movie town. I'm also going to redesign my website... or I should say, have my wonderful artist husband redesign it. But I definitely plan on taking all the credit. And, of course, I'll get the news out on Facebook, Twitter, and a revolutionary new thing I just heard about... in-person book signings! I have a few other ideas up my sleeve, but you'll have to wait till 2012 to find out. You signed a two-book deal with Putnam. Is there anything you can tell us about your second book (or is it too soon)? What are some of your favorite books (or who are some of your favorite authors)? Are you drawn to the paranormal? Growing up, I was definitely drawn to fantasy, sci-fi, and paranormal. I was particularly fascinated by Madeleine L'Engle's mix of magic and science, especially in A RING OF ENDLESS LIGHT. I mean what's better than telepathic dolphins? But I also loved mysteries, like the WESTING GAME. And I devoured Lois Duncan's books, which often had a bit of both. Over the years, as kids and YA books have thrived, I've found so many other favorites. TRICKSTER'S CHOICE by Tamora Pierce, any book by Diana Wynne Jones, FEED by M.T. Anderson. But I also have a soft spot for ridiculous and bizarre middle grade, like Daniel Pinkwater's LIZARD MUSIC, any book by Roald Dahl, WHALES ON STILTS by M.T. Anderson, and THE TRUE MEANING OF SMEKDAY by Adam Rex. What advice would you offer the pre-published? Well first of all I would say, your path is not the same as other people's paths. So many times we hear writers say that this or that was the key to their success. Like me and my Wonder Women connection with Michael. What? You like the Green Lantern instead? No book deal for you! It can be super stressful to think you're not doing all the right things to get published. But the truth is that some people find exposure in blogging, others at conferences, still others are keeping their heads down and working diligently on their own. At some point you have to stop looking around at what other people are doing and find out what works for you. You need to seek out things that feed you creatively and play to your strengths, not other people's. That said, my other piece of advice is: Push yourself out of your comfort zone. You need to be an advocate for your book and yourself as a writer. Every bit of movement I've had towards publishing has been because I listened to that little voice in my head and forced myself to ask the question, write the email, or send out the manuscript. Think of how parents are with their children. They are willing to put themselves on the line to help their child have the opportunities they deserve and become the best people they can be. You have to think of your book this way. You've created this lovely/funny/thrilling/whatever-ing story and it needs you to be fearless so that it can get out and live in the world. This week's picks and links are heavy on blog posts reacting to the New York Times piece forecasting the doom of the picture book, along with usual tips from agents, practical and crafty tweets, National Book Award winners, and more. @BostonBookGirl So many fairies in my slush today! It isn't you, it is me-- I am just not really a fairy person (and I dislike faeries more). @SarahGreenhouse My best work tip: What is the thing that makes you most anxious? Identify it - and do it immediately. Then the day can only get better! @curiousmartha Esp since can't copyright titles! RT @ElanaRoth Guys, don't copyright your title & then put the little (c) next to it every single time. @ElanaRoth Also, if you're an illustrator and refuse to have an online portfolio for fear of theft, you're in your own way. Watermark images instead. 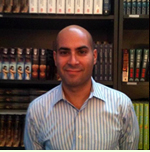 John Rudolph recently joined Dystel & Goderich as an agent after a dozen years working as an acquiring children’s book editor, first at Simon & Schuster Books for Young Readers, then Penguin imprint G. P. Putnam’s Sons, where he was Executive Editor. At Putnam, John worked on a wide range of young adult, middle-grade, nonfiction, and picture book titles. Among the authors and illustrators he's worked with are Pete Seeger, Jack Higgins, Padma Venkatraman, Brenda Woods, Pete Hautman, Royce Buckingham, Phil Bildner, Richard Michelson, S.D. Schindler, Barry Moser, and Mary Azarian. Here he talks about his move, what he's interested in, his agenting style, more. If you'd like to meet him, John will be among the agents and editors critiquing manuscripts at the SCBWI Annual Winter Conference Writers Intensive. Click here to register. Why the move from editing to agenting? And will you be a hand-on agent when it comes to working with your clients' manuscripts? Well, as much as I loved being an editor, after 12 years in that role I felt like I needed a new challenge. But, as I cast my net around in the job market, I realized pretty quickly that I wasn’t qualified to do much else! So agenting seemed like a way to gain some new skills and perspective in the book business, while still being involved with authors and artists, which was always my favorite part of editing anyway. And I was very attracted to the personal stake agents have in their clients’ careers—working at a large company, I sometimes found myself losing sight of that. As for being hands-on, certainly my natural inclination is to work closely with clients on their manuscripts. That said, I’m leery of over-editing, because ultimately that’s not my job. But we’ll see how it goes—I’m sure there’s a balance in there somewhere. Tell us about the types of books you worked out at Putnam and what you liked most about editorial work. I was very lucky at Putnam to have the freedom to edit more or less whatever interested me. 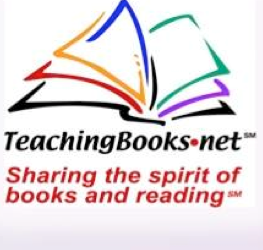 Hence, I worked the full range of children’s literature—young picture books, older nonfiction storybooks, middle-grade and YA novels and even some adult book adaptations. And as I said, the author/illustrator/editor relationship was always my favorite part of the job. Since you just joined DGLM you certainly must be actively building your list. What types of submissions interest you most? Right now, I’m open to pretty much anything and everything, though I will say that I’m not actively looking for picture book manuscripts unless they’re by author/illustrators. What do you want in client? What don't you want? Could you describe your agenting style? I trust that whomever I work with will have reasonable expectations about the marketplace, as well as a professional attitude toward their work—I’ve never had much patience for the "artistes" who need a lot of hand-holding and ego-stroking. As for my agenting style… as soon as I figure it out, I’ll let you know! 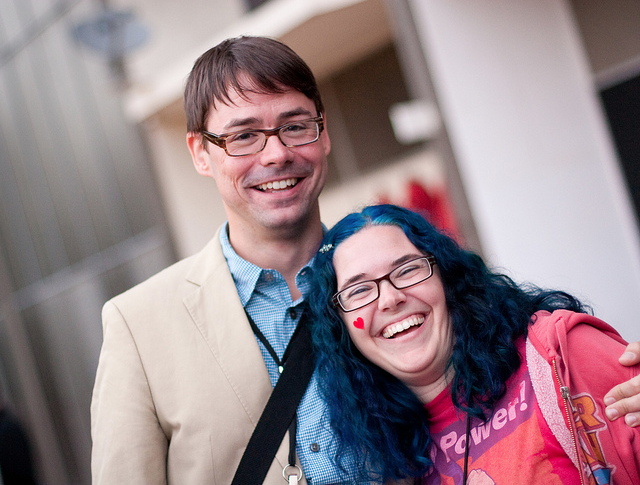 Do you have any conferences or events coming up where writers could get a chance to meet you? Can you offer some general advice on making a good impression on an agent? On writing a good query? Again, professionalism goes a long way—with the volume of submissions I’m getting, it’s hard to spend time with someone who doesn’t take their own work seriously. And for writing queries, it always bears repeating: follow the submission guidelines! Among this week's news: New York Times on the suffering picture book; Open Road Media's new addition signal children's books ahead; Scholastic's reading report; reasons you may be losing Facebook friends; NYC is top Twitter city (I'm sure it's all the publishing tweeps); a new book featuring literary tattoos (guess who's got the Mad Hatter on her bum? ); iPad and Facebook continue to take over the world; NYT's "spaghetti taco" expert (who's hungry? ); bye to "Huge" (sad face! ); and more. Picture books are so unpopular these days at the Children’s Book Shop in Brookline, Mass., that employees there are used to placing new copies on the shelves, watching them languish and then returning them to the publisher. The picture books section at Politics and Prose Bookstore in Washington. Even some best-selling authors feel the pinch. “So many of them just die a sad little death, and we never see them again,” said Terri Schmitz, the owner. The shop has plenty of company. The picture book, a mainstay of children’s literature with its lavish illustrations, cheerful colors and large print wrapped in a glossy jacket, has been fading. It is not going away—perennials like the Sendaks and Seusses still sell well—but publishers have scaled back the number of titles they have released in the last several years, and booksellers across the country say sales have been suffering. Children's publishing industry veteran Barbara Marcus has joined Open Road Integrated Media as an adviser, and will help lead the company's entry into the children's market. She will also help further Open Road’s international business development and consult on general strategic issues. The other day in Essentials I pointed to a New York Times piece, reg. required, on the latest Kids & Family Reading Report out of Scholastic conducted by the Harrison Group among children ages 9 to 17 and their parents. Some of the big takeaways were enthusiasm from young readers towards adopting new digital platforms like eBooks (not at the sacrifice of traditional books! ), concerns coming from parents around digital distraction (with some notable quotable exceptions: One father says, "The need to read and comprehend video game instructions seems to have helped my son’s reading ability..:") and, lastly, a persistent lack in information literacy when it came to "reading" the web. Apple’s iPad sold three million units in the first 80 days after its April release and its current sales rate is about 4.5 million units per quarter, according to Bernstein Research. This sales rate is blowing past the one million units the iPhone sold in its first quarter and the 350,000 units sold in the first year by the DVD player, the most quickly adopted non-phone electronic product. Start Tweeting the news: According to the Social Business Report study from marketing database outfit NetProspex, New York is the top Twitter city—which NetProspex defines as cities with the most active businesspeople on the microblogging site, based on employee presence and average numbers of Tweets, followers, and profiles followed—reports Katie Kindelan from sister blog Social Times. Alexandria Marzano-Lesnevich was sitting down for a meal at Bread Loaf Writers' Conference, when she found herself under critique "I sat down in the cafeteria," the Jamaica Plain writer recalls. "One of the famous poets who was there to teach sat down next to me and read the first line of the Sexton poem off my arm, and he said, 'That's a terrible poem! That's not one of her good ones!' " The eminent bard—she wouldn't name names—found fault with Anne Sexton's "Curse Against Elegies." That poem, along with Edna St. Vincent Millay's "Dirge Without Music," wash over each other to form the outline of an orchid on Marzano-Lesnevich's bicep. She didn't take offense at the poet's criticism. "I just let him talk," she says. "How often do you get to hear a famous poet rail against another famous poet?" At that same conference, the tattoo led to another, more fortuitous encounter. "Amy MacKinnon [the Boston-based author of the novel Tethered] saw my tattoo and said to me that a woman in her agent's agency was putting together a book of literary tattoos." Glee creator Ryan Murphy is planning to devote an upcoming episode of the show to bullied gay teenagers following the recent suicides of tormented youths in America. The writer is hoping the hit show, which features a gay high school student played by Chris Colfer, will show fans struggling with their sexuality how to cope with any taunts aimed at them. Remember three years ago, when Microsoft paid a quarter-billion dollars for 1.6% of Facebook and the exclusive right to run banner ads across Facebook.com? Tell the truth, how many of you thought that was a killer business decision? I can’t say I did at the time. But as that deal is about to expire in 2011, Facebook’s status as a revenue juggernaut is rarely questioned any more. In tomorrow's NYT, reporter Helene Stapinski performs what might appear to be a near-impossible feat of journalism dexterity--producing a college professor to support her thesis that more Americans now consume spaghetti tacos than ever before. "Spaghetti tacos has made it possible to eat spaghetti in your car," Robert J. Thompson, a professor of popular culture at Syracuse University, tells Stapinski. "It’s a very important technological development. You don’t even need a plate." Last week SCBWI Executive Director Lin Oliver and SCBWI President Stephen Mooser received the Mentor award at The Carle Honors ceremony held in New York City. 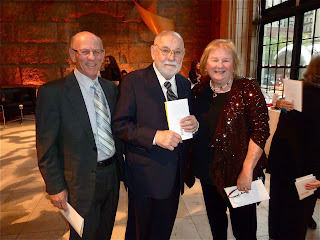 The awards, given by the Eric Carle Museum of Picture Book Art, celebrate "the creative vision and long-term dedication of key individuals and organizations to the art of the picture book and its vital role in supporting art appreciation, early literacy and critical thinking." Other recipients included David Macaulay (Artist), Kendra and Allan Daniel (Angel), and Nancy Schön (Bridge). "It was a beautiful evening, in a fabulous and elegant space under the 59th Street Bridge," Lin told the SCBWI Board of Advisors. 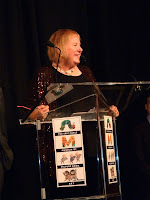 "Pat Cummings introduced us, and described the work of the SCBWI. Steve and I said a few words about SCBWI’s humble beginnings, and how it has grown into the powerful and proud organization it is today. 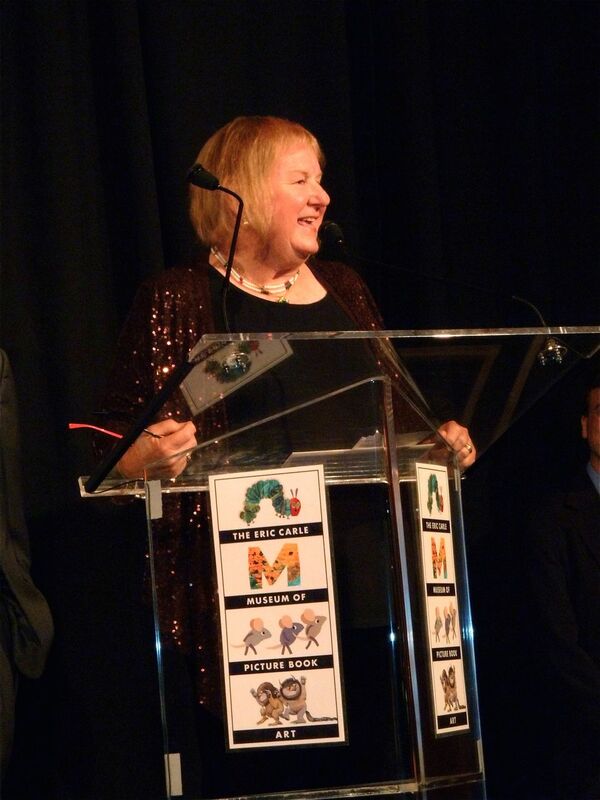 I hope we gave proper credit to all the central figures who forged our mission and our group... Sue Alexander, Jane Yolen, Sid Fleischman, Don Freeman, Tomie dePaola... those who were there from the first day and put us on the map." Considering the number of awards and grants SCBWI offers, Lin and Steve are more often on the giving end of such honors. "We are always more comfortable giving out awards than receiving them, especially for work that has been done by so many dedicated people throughout the years," Lin says. "Next summer in LA will be our 40th conference. That is awesome, humbling and terrifying all at once. Standing in front of that group Thursday night, though, we really felt the impact of those 40 years, and it was one of those moments when you just stand back and say, 'Yes, this is good.'"